Native Instruments has released Traktor version 1.2.3. The main focus for this update was providing support for the controller Traktor Kontrol X1. Additionally, the update contains several fixes and improvements. Because Traktor 1.2.3 is released the following information is available. The review of Traktor Kontrol X1 will be online soon. Update PDF: What is new in Traktor 1.2.3? 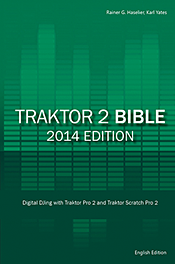 free for all owners of "Traktor Pro Bible" and "Traktor Bible, Second Edition"
This Traktor Bible update is the most complete reference about all new and changed features of 1.2.3. As usual you will find information not avaialble in te offical addendum/manuals. Come back regularly or subscribe to the Traktor Bible newsletter if you want to be informed by mail when new tutorials are avaialble. In preparation for the next Traktor update it could be a good idea to download, install and make yourself familiar with the tool Traktor Pro Launcher, which has been developed by Traktor user DJ Ali and which can be downloaded for free. 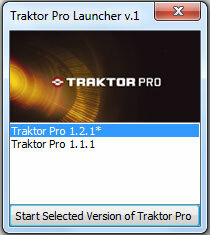 Traktor Pro Launcher is a Windows tool and allows you to install different Traktor versions with different settings (tsi files) on the same computer. After installation and configuration you start Traktor via the Launcher shown in the figure above. Select the version you want to use and click the button to launch Traktor. Download and more information can be found here: www.ali.dj/traktor-pro-launcher.